Why Can’t I Watch the BBC Online Abroad? It’s often a shock, after all why offer an online version of the BBC and then block anyone who isn’t in the UK. But for many trying to access BBC Iplayer when they’re abroad becomes a bit of a challenge, you know it’s possible but connecting up can be difficult. The search usually leads to things like VPNs and proxies, which for anyone living abroad are now essential – they basically give you access to all the best media sites online – irrespective of your location and IP address. So when the BBC, Hulu, ABC or M6 Replay checks your location and IP address and then decide what you can see – the proxy or VPN just tells them what they need to see – and allows you access. For instance, I was recently in Spain with my work and got kinda bored staying in a hotel. So decided to watch some UK television online using my laptop. Unfortunately I then discovered that because I then had a Spanish IP address (from the hotels Wifi), I was now blocked from all the best UK websites like the BBC Iplayer and ITV etc. It was kind of annoying until I discovered there was a solution and an easy one at that. 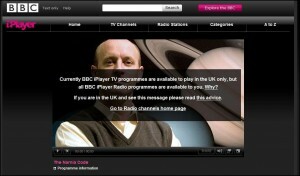 By the way if you don’t know why people are so keen to get access to BBC Iplayer – you should really check it out. It’s without doubt one of the best media resources available online, in fact I don’t think anything comes close although there are some excellent US sites like Hulu and Pandora for music. Anyway for those of us who either live or travel abroad a lot, having access to these sites is a godsend. You don’t have to sit watching a TV show in a language you don’t understand or some awful cable channel. So What is the Solution to Watching BBC IPlayer Abroad? Basically the problem is your IP address, everyone is linked to a specific country and it’s very easy to look up. Many websites look your location up as soon as you access their site, they then tailor what you can see based on that information. It’s called Geotargeting and frankly it’s extremely annoying – you’ll normally get an error message like the image below. 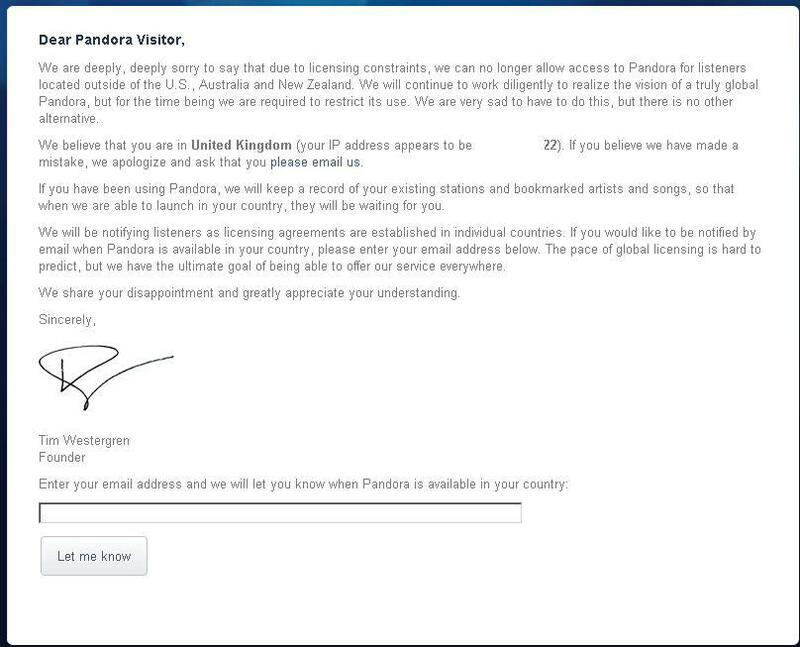 Or perhaps this one if you try and access Pandora outside the US. The way around it is quite simple, you just have to make the website think your in a different country by using an IP address from the required country. Unfortunately you can’t modify your own address easily as this is assigned by your ISP. However you can connect via a proxy server based in the correct country and use it’s address. So for example to watch BBC Iplayer outside the UK you’d connect through a UK proxy. 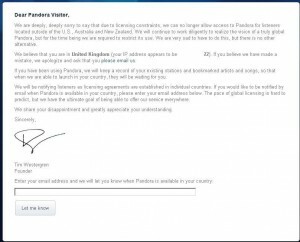 If you wanted to watch Hulu from outside the US then you’d need a USA proxy, Pandora needs an American one too and so on. Where do I get a Proxy Server to Watch Iplayer or Hulu? There’s a few options depending on time and budget. You can find some free ones online if you search – however it takes a long time to find one in the right country and fast enough to relay video through. In reality you’ll be best to settle on one of the many services that are available. A commercial service should be plenty fast enough and you know it will always be working when you want to watch something. The biggest problem at the moment is Netflix which has been actively blocking both proxies and VPNs based on the categorization of the IP address – you can read about it here – Netflix blocking proxies. The one I use is Identity Cloaker which has been around for many years – it’s way better than any of the TV watching services and does much more. Try the trial first if you are unsure to test it out – trial – it gives you access to all the top media sites in UK, USA, France, Canada and Germany to name only a few.